Whenever it snows and classes are cancelled, Missouri students do not get a hall pass. Missouri school districts currently require school districts to schedule a specific number of instructional days every year. If school is canceled due to a snow storm, districts are required to tack on an extra day at the end of the year to make up for the loss. KANSAS CITY, Mo. 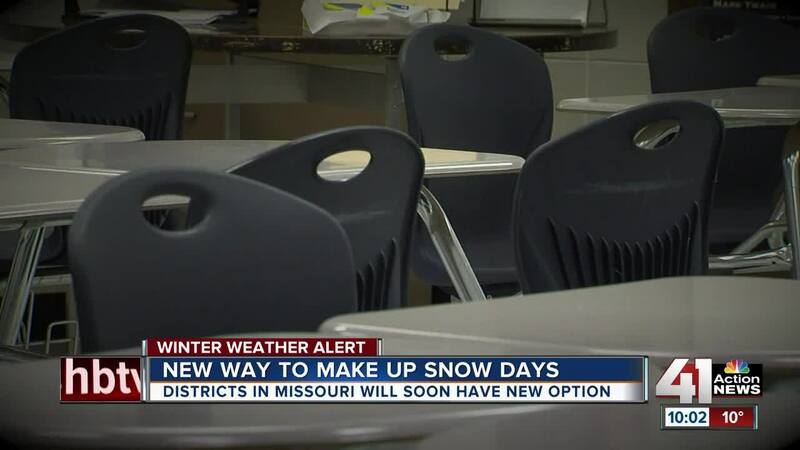 — Whenever it snows and classes are cancelled, Missouri students do not get a hall pass. Missouri school districts currently require school districts to schedule a specific number of instructional days every year. If school is canceled due to a snow storm, districts are required to tack on an extra day at the end of the year to make up for the loss. So far, this year, North Kansas City, Park Hill and Raytown will have to make up five days. KCPS students will also see their summers cut short. "When you have a situation where we haven't had a five day week since we've been back from winter break, that interrupts education and that also interrupts a lot of the social determinants," Melissa Robinson, the chairman for the KCPS Board of Education. But next school year things are changing. Beginning in the 2019-2020 school year, Missouri school districts will be required to have a specific number of instructional hours. This allows districts to be flexible-- instead of tacking on days at the end of the year, school districts can add minutes to the days. KCPS helped lobby for the change. According to this district, this change will allow for more instruction before state exams and prevent classes from cutting into summer breaks. Kansas currently allows school districts to extend the school day to make up the lost time.